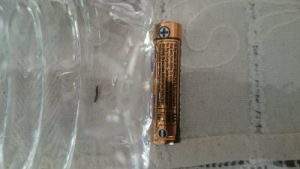 In this first photo, our reader has placed the creature in question next to a battery. This is incredibly helpful because it allows us to use the battery for size comparison and understand how small the organism is. 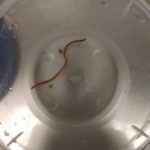 Based on this photo and the information we got from our reader, we don’t think he is dealing with a parasite…we think the creatures he has been finding are drain fly larvae. This next photo provides a closer look at the organism. We are confident that this is a drain fly larva. 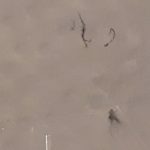 These tiny black worms are segmented and covered with tiny hairs. They are also common household pests and nothing to worry about! We do recommend that our reader do a little work to get rid of them, but we don’t believe they are parasites that are coming from his body. Drain fly larvae live in the organic matter that builds up inside a drain. This gunk is where they breed and even what they eat! 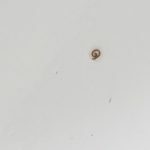 If our reader has been noticing them in his toilet, it is just a sign that he needs to give it a thorough cleaning, not that he has a parasite. 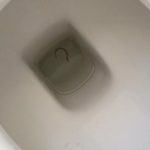 To clean out the toilet bowl and drain, he will need a pipe cleaning brush and a cleaning agent designed to eliminate organic material. We recommend Bio Drain Gel or Bio Clean Powder, both available on Amazon. He should thoroughly scrub all the surfaces, pour hot water down, and repeat. 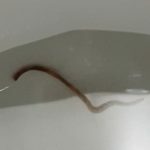 Once there is no more gunk in his drain, there won’t be any more larvae in his toilet! 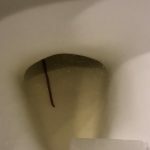 To conclude, we believe the tiny black worms our reader found in his toilet are drain fly larvae, not parasites. 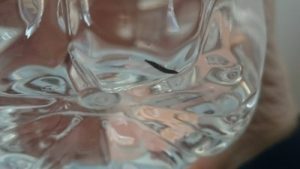 Drain fly larvae aren’t considered harmful and aren’t known to carry or transmit human diseases. 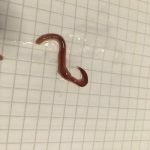 If our reader is still convinced these worms are coming from his body, then we encourage him to see a doctor! We aren’t medical professionals and therefore can’t weigh in on medical matters. 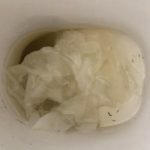 We believe the tiny black worms our reader found in his toilet are drain fly larvae, not parasites. 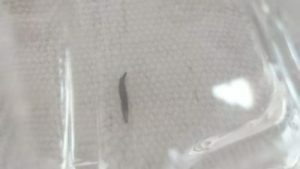 Drain fly larvae aren't considered harmful and aren't known to carry or transmit human diseases.